Toys "R" Us has confirmed the well-known secret that the new Mega Yarn Yoshi amiibo will be exclusive to its stores. The soft toy - which is a larger variant of the existing Yarn Yoshi - does now have a release date; it launches on November 15th and will only be available in store. Mega Yarn Yoshi joins the Mii Fighter 3-pack - which launches on November 1st - as a Toys "R" Us exclusive. As previously confirmed the retailer is also getting a restock of the desirable Animal Crossing Villager, an early amiibo release which has proven tricky to get hold of. The restock is taking place on November 8th. Will you be queuing up to purchase any of these? How do you feel about retailer exclusives like this? Let us know by posting a comment. This is really good news for America and I have seen that they already have a pre-order available for the Falco amiibo too! I am personally waiting for the Falco amiibo to become available to order over here in the UK and I will have 52/55 Super Smash Bros. amiibo by the day it is released. Not spending that much, I'll be fine with the smaller version. Well Mega Yarn Yoshi is not for me. Maybe one of the smaller ones though. @JaxonH "and will only be available in store"
I'm actually OK w/ this one as long as it's just a variant on the little yarn ones. So it's really unnecessary. Unless it does something really cool in game like make Yoshi huge or something. I think regular Yoshi and Yarn Yoshi are different, but if this is just another yarn Yoshi, well then it's the least of Ntinedo's sins. Now can somebody wake up Reggie and tell him the store updates in 2 1/2 hours and I'd like to know what will be in it, if that isn't too much to ask, not like the EU finds out on Monday or anything. .
Why? For God's sake why? It's a children's toy at a toy store. I'm not in America but this still p*sses me off. 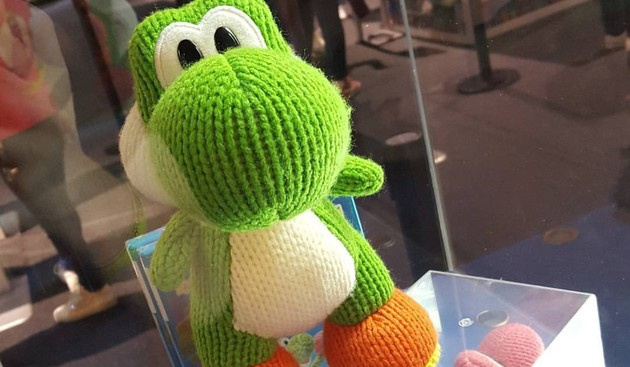 Meanwhile Europe is drowning in Mega Yarn Yoshis. Sounds about right. Causing the price to sky rocket on resales. @manu0 "Meanwhile Europe is drowning in Mega Yarn Yoshis." THIS needs to be a photoshopped image! I wanna hug it guys. I'm hugging the screen but nothing is happening!! Darn, why it have to be extremely limited instead of just limited and on a weekend. Now I'm thinking if I should just get the blue Yoshi instead since I only want one. Guess I'll see how tomorrow impulse plays out. And the cancerous marketing continues. Ooh, yeah, I'll totally drive 200 miles for the mere possibility of buying a toy I want. I can understand 1 exclusive but why are all of them at TRU? I don't live close to one and it isn't going to be online. Well... looks like I am going to have to buy off someone or take 3 different days off to travel. Toys "R" Us is the last store I ever visit for video game needs. Its a good thing I don't care about wasting money on Amiibos. Quantities will be extremely limited ... meanwhile on eBay quantities will be expensively available. I wish retailers like Toys R Us would stop releasing amiibo (specifically the Mii Fighters) on Sundays. Game releases I could care less about as they rarely sale out, but when you have religious objections to buying on Sunday it's frustrating that they as the only retailer providing them would choose to release on a Sunday. I suppose I will just have to wait until that Monday to see if they happen to have any remaining stock. But again, maybe they will be like GameStop's Retro 3-pack and be available in large supply for days. Annoying retail exclusive again. Also, I don't see why they wouldn't flood the market with these a bit more. Even w/out an amiibo chip in them, they are going to be adorable enough for people to pick up. Even people who just remember him from Super Mario World in the 90s. It comes down to this: If amiibo were as well stocked as DI figures, we'd have probably 10 more of them. Not saying I'm representative of anything, just that it's frustrating to me personally. It also has a price in Canada: $60. Eff that noise. I'm getting the Yoshi amiibo bundle tomorrow and I'll be satisfied with the smaller Yoshi. Well, then. I wonder what the TRU tax will be for the Mega Yarn Yoshi. For those of you unaware, MSRP for an amiibo is $12.99, but TRU charges $13.99 for some arbitrary reason. I wonder how much of an increase we'll see with Mega Yarn Yoshi. @aaronsullivan Yeah, that's the debate we always get into. The general we, not you and I. Amiibo can be had by people who make the effort, but there always seems to be effort involved, you can never just walk into a store and buy 1. Well you can walk into any store and buy Mario, but that's about it. We'd probably have a few more too. I know I keep saying that I won't, but I said that about DI 3.0 and I think I told you how that turned out. Olimar, Gandolf, Dark Pitt, Paluntena, Rosalina just off the top of my head. Oh and Metanight and King Deedede. Guess that gets us close to your 10. The $40 one still seems unnecessary though. Great as a toy - we have a big Elmo and a few others - but at least the game bundle is everywhere, and the other yarn Yoshi colors. Unlike the SMM Wii U bundle, Walmart exclusive, that needed to be everywhere. If you want one of these for your kids I do hear ya, super cute. @Ferkner LOL What??? $60? and I thought the exclusiveness was bad enough. He complains, but try living in Costa Rica and being greeted by those "in store only". I am buying from Amazon Germany, these US retailers are being greedy, so they won't get my money. Even if I could. Ugh. I do not want to have to ride across town for an amiibo that was not a retailer exclusive originally. Importing. Just Villager for me. I spent over $50 on amiibo restocks last week, so I don't want to go overboard. @sinalefa Yeah, I can see that being a problem. On the bright side, I'd bet your weather is a lot better than mine or Jax. I need to turn my heat on this weekend. @Spoony_Tech Did they even list a price?